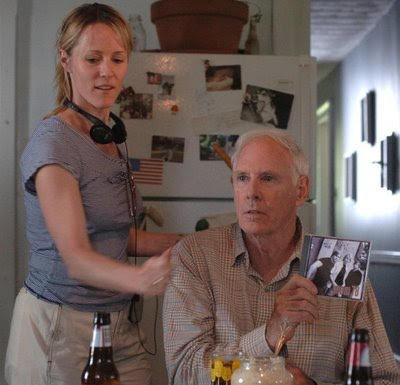 Mary Stuart Masterson, is charming, ebullient and intelligent... and an actress and the director of The Cake Eaters, to be shown on Saturday evening (July 17, 7:00 PM) at the Stony Brook Film Festival (SBFF) (see our post on SBFF below). In this film, she tells an interesting, romantic story, about difficult and troubled people. The acting, especially by Kristen Stewart, is dead-on. Kristen plays an adolescent girl with a serious disease and, thinking about the film, I kind-of had to keep reminding myself that Kristen was an actress and not a patient recruited for a film role. What makes the film most special, it seems to me, is that it is uniquely American in a way that few films are. It was shot on location upstate in New York, and has an authenticity that comes from being firmly rooted in the present time in a real place in this country. The film was shot with understated realism by Mary Stuart’s brother, Peter Masterson. The story is contemporary and gently treats of romance and relationships, difficult and otherwise. The character’s talk, and the action proceeds, with a rhythm that is genuine to the place, the time and the story. The script, by Jayce Bartok, who also appears in the film, has not been formulized the way studio films are. Mary Stuart comes from a family and milieu of actors and directors. Her mother is the Tony winning actress Carlin Glynn. And Mary Stuart has appeared as an actress in films which are something of a family affair, such films as The Trip to Bountiful, written by the playwright, Horton Foote and directed by her father, Peter Masterson (who is Horton Foote's cousin). Mary Stuart's father is a charming, and intelligent (Note: it's not a coincidence that I used the same adjectives to describe Mary Stuart) actor, writer and Tony nominated director (for The Best Little Whorehouse in Texas). That understanding of family, and that tradition of crafting film and theater which is in her background history, seems to inform the decisions and structure that were made in crafting a film that portrays sophisticated relationships, and that looks and feels unique and genuine. There is likely to be a Q&A with Mary Stuart after the screening on Saturday. With a diverse and interesting schedule of films, the Stony Brook Film Festival seems like a very good place to visit between Thursday (July 17) and Saturday (July 26), with the first Saturday night (July 19) a particularly fine time to attend, for the screening of The Cake Eaters. Note (July 25, 2009) -- The Cake Eaters is now out on DVD. Below is a link to watch the film online or buy a DVD. 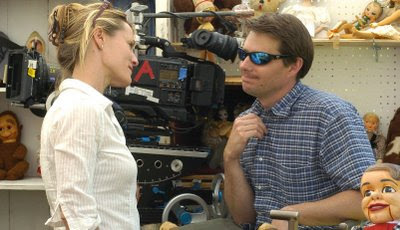 Also, Mary Stuart has produced a new film, Tickling Leo, written and directed by her husband, Jeremy Davidson, which is being shown today at the Stony Brook Film Festival 2009.